Don’t you dare shout friend or enema at me! You read it right, semi-colonic irritation, or perhaps more accurately semi-colonic anguish. This is a writers rant and, even if alcohol is enjoyed by many writers, not about the consumption of intoxicating fluids. If you must have a fluid read? 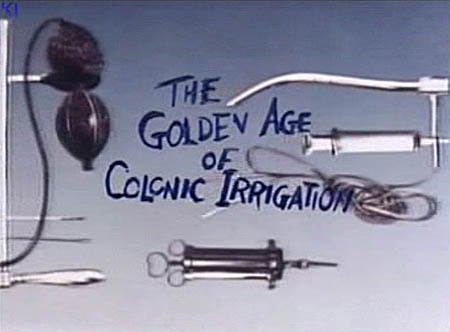 Monty Python did a piece on the history of colonic irrigation. It doesn’t offer much information, but at least it’s a start. If you must have more detail, here’s an article about alternative methods for the intake of fluid, with many comments attached. This offers further insight. I hope you’ll forgive me if this post provides less than you hoped for. May Google favour you with the information you seek, and I wish you the full flush of success in your investigations. A while back I discovered the semicolon. What excitement. There I was with a new thingy and somewhere to use it. Boy, I was going to strut my grammatical stuff, and impress the writing world. Semicolons erupted in my fiction. Imagine, 200,000+ words of prose, punctuated with my newfound favourite. Picture the emperor’s face when he discovered his new clothes for what they were. Of course, it isn’t always something your best friends will tell you. Such was the case for me. Watery eyed, I stared another revision in the face … a feeling akin, perhaps, to a novice mountaineer standing below the North Face of the Eiger. Are semicolons like the Appendix? My appendix causes me less trouble than semicolons. Of course, the appendix is useless. They talked of removing them from Astronauts, as a matter of routine, to avoid them causing problems. I took the advice. My Lord, how it hurt, and how worthwhile the pain. My editor injected a modicum of sanity and my reduction was huge. Removing semicolons was, mostly, a good idea. Many writers will be familiar with the joys(?) of revising a book. Of course, semicolons have a place and, doubtless, other writers and readers may have different views. However, I don’t regret the work and believe my fiction is the better for it. If NASA care to follow the principles uncovered here, they better start whipping appendixes out as a matter of urgency and not only the Astronauts’.